Before Italy entered the Great War in May 1915, Marinetti and a number of other prominent futurists (mostly painters) had joined the Lombard Battalion of Volunteer Cyclists and Motorists: these volunteer groups had been around since 1905. Marinetti’s battalion was mobilised on 23 May 1915. They trained through June and July, and left for the southern shores of Lake Garda at the end of July. In mid-October, they were posted to the front line, where the Italians confronted the Austrians, and stationed at Malcesine, on the eastern side of Lake Garda. They fought alongside the elite Alpine soldiers in the capture of Dosso Casina in October; despite their success, they were disbanded shortly afterwards. students, monarchists, revolutionary workers, law-abiding lawyers … persecuted anarchists, Freemasons and clericalists, poor and wealthy, traditional painters and poets, avant-gardists, Futurists and semi-Futurists, who had already met in the Piazza del Duomo and in the Galleria, almost every evening, during the winter and spring, to punch and chase away the neutralists (quoted Daly, 324). Most of them were irredentists: that is, those who wanted to recapture those parts of Italy that had been lost to foreign powers, notably the cities of Trento and Trieste. Marinetti served as an ordinary soldier, suffering the same hardships as the others, which given their lack of equipment was considerable: “without gloves, without balaclavas, with just a light cape, no wine, no alcohol, no coffee, one loaf of bread between four men, one tin of meat between three, Siberian wind in our bones” (quoted Daly, 326). They obtained alcohol at some point, since one of the reasons behind the disbanding of the battalion was their reputation for drunken rowdiness. Marinetti’s involvement with mountain warfare to some extent fitted in with his Futurist ideas: height was sublime, like flying at speed. But Marinetti, like other Futurists, were essentially urban intellectuals, and for Marinetti the best landscape was that which had been tamed or altered by men. Before the war, he had praised “multicolored billboards in the green meadows, iron bridges which chain the hills together, surgical trains that cut through the blue belly of the mountains, huge turbines” (quoted Daly, 329).
. . . broke all records of transformation, patience, agility, impetus, speed . . . . The most diverse forms of activity, the struggles, the hard-working energy of bees, maximum discomfort from bad weather, pain and the exertion of a caravan of Siberian prisoners, all the most difficult, painful and thrilling things that patriotism can impose on Garibaldian hearts was withstood and experienced by us with ease (quoted Daly 333). In Decmeber 1915 he was given leave, and in 1916 he toured the country, giving speeches, and putting on what he called “violently patriotic anti-neutral and anti-German” shows (Kramer 199). In December 1916 he returned to active service, as an officer. 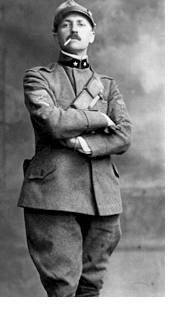 He was trained in artillery, and was in the front at Gorizia in February 1917. After an illness he returned to the front, and was injured in the attack on Monte Kuk. After convalescence, he was promoted to full lieutenant, and returned to the front. He was a company commander by the end of the war, participating right to the end. Alan Kramer notes that he was well-regarded by some generals, and admired for his fiery and aggressive rhetoric. General Capelli asked him to speak to the troops on the eve of the tenth Batle of Isonzo. General Cavigli had met with him several times, and on 20 April 1918 expressed his sympathy with the Futurists for their heroism, and for “the example they gave in the face of the imbecilic masses” (quoted Kramer, 206). Marinetti denounced Germans and Austrians for their atrocities, while urging Italians to do the same: “few prisoners, many stabbed, and the rest kicked down from the conquered summit” (quoted Kramer 203). We might end with a comment that after Marinetti’s visits to London, before the War, the only real apostle he found was Christopher Nevinson. Nevinson’s earliest war paintings show a strong Futurist influence. As the French futurist Guillaume Apollinaire put it, “He has set down on canvas the mechanistic aspect of the present war: the way in which man and machine are fused in a single force of nature.” In La Mitrailleuse the machine-gunner are “grim-faced, dehumanised beings”. But Nevinson was to drop his allegiance to Futurism, and depict the war dead and the grim reality of it all. As Wyndham Lewis wrote, “Marinetti’s sole disciple has discovered that War is not Magnifique, or that Marinetti’s Guerre is not la Guerre.” (For all this, see Kramer 170).